So I was fortunate enough to get an invite to the North American masters based on my player ranking, I was ranked 11thoverall mainly on the strength of my performance at Buckeye and Infernal Zoo where I came in tied for 7th/96 and 4th/36 respectively. I’ll do an AAR once I finish the bat reps, but a quick thought on what I was going for here. 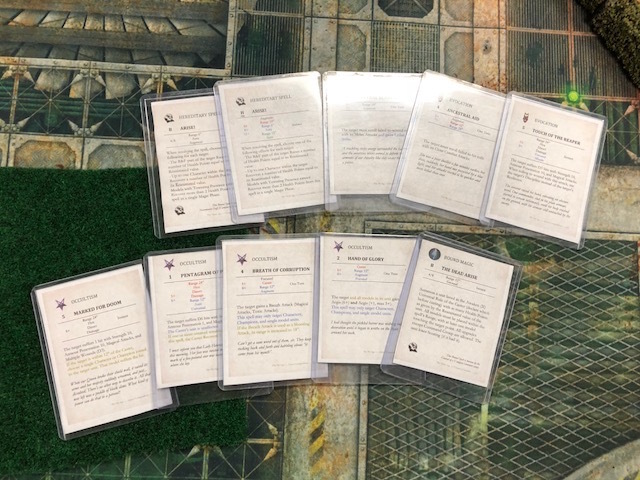 I really wanted to increase my overall shooting output from Buckeye and I needed to have better answers for demon legions, as I knew there’d be at least 4 at the tourney. So, pyro and the nova lance were my answers for demons, the 2x5 QG and 2 SGRs vs 3 SGRs make a more flexible shooting phase that can be more mobile and puts out more damage against low res/armor targets. It also is fairly mobile as most of the infantry have relentless company and the fliers and Knights are great for zoning and flanks. I do think that the changes I made to my list help stabilize the DL/VS match up, but I still think they are not great. The VS list with vermin demon, double dreadmill, plague pendulum deathstar, lightning rod my list just really struggles with. Really I think any HBE list that has any significant points spent in fliers can only hope for a small win at best against this build and probably averages a medium loss. Of course, all 4 of the VS players took very slight variations of this exact list. My pairings ended up being almost a perfect representation of the spread and I was happy to see no ID. There’s pros and cons here, he has a ton of snipe spells, basically 4 that I care about to varying degrees, in order from caring most to least (Marked for Doom, Touch of the Reaper, Breath of Corruption, Hasten the Hour) which will really keep my fliers honest. But he’s also generally fairly slow with his key damage dealer a move 4 infantry model and pyro really helps with the ethereal and vargheist match up. Also, our mission was breakthrough and the volume of scoring combined with ravens wing make my list a threat in that objective. 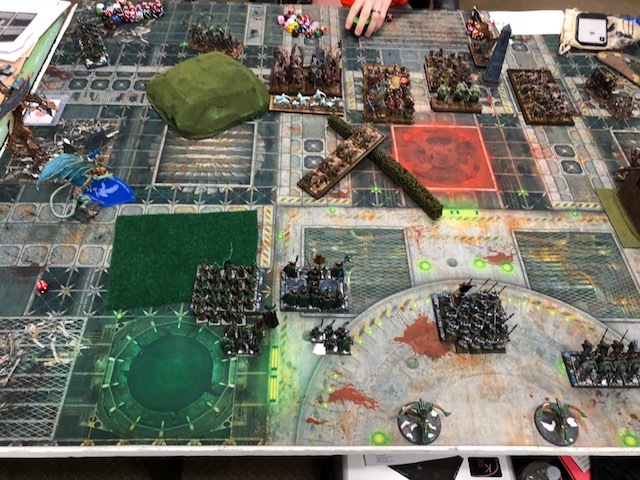 My battle plan was to avoid his Vampire Count and Skellie block and try to pick up the ethereals and Vargheists and breakthrough shooting for a 10-13 hopefully (I think winning big is hard bc I don’t have a good way to get the Vampire) and I’d have to feed him some things to hold him back. Let’s see how it goes. We alternated for a few and then he dropped everything for first turn. He advances full steam ahead with his infantry, coach and BSB in the center and on my right and he keeps the Vargheists hovering around the hill. I manage to take off his spectral hunters and start culling his vargheists and get the dragon mage into his back line forcing him to bail his necro into the main skellie bunker. A unit of QG and a spear block were pushing up in the wake of the dragon mage for the objective on the left. He had pushed through a wound or two on each character with the snipes by this stage. 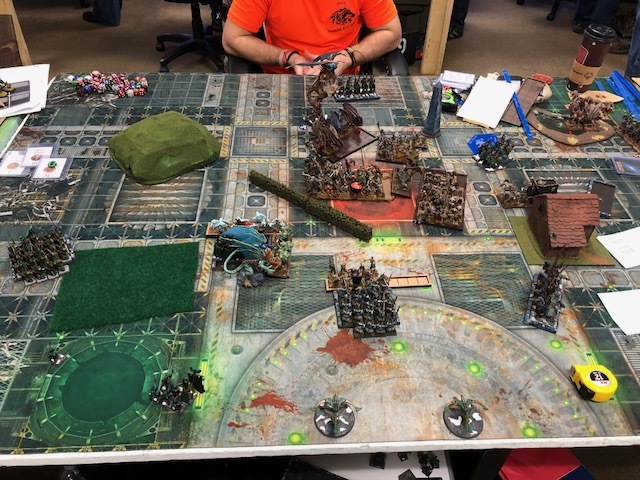 I decided I would give him my Flame Wardens in the center to hold up his blocks and overran after clearing his chaffing dogs into his spirit hosts. He took the ghasts in the flank of the Wardens and we started grinding. Here I made a small mistake and changed my plan when I saw I could get the griffon prince into the ghasts. Doing the math, I should blow through the ghosts and put a big crumble on his spirit hosts and the griff prince should overrun to safety (can flee past spears if he charges the next turn). Unfortunately the griff prince underperforms, and only does 2-3 wounds and gets stuck. The dragon mage manages to clean up the vargheists and overrun into the former necro bunker. Ultimately, the skellie block comes into the Wardens, breaks them and runs them down while overrunning into the griff prince and finishes him off. I should have kept the griff prince out of combat to preserve the points and stuck with my original strategy of sacrificing the Wardens. The big unit of zombies comes into the Ryma Knights, the Knights get broken and outdistance their pursuers. This was a very unlikely outcome and ultimately cost me the objective. The coach hits the blue spears and ultimately grinds them out. I kept moving my QG and Spear block up into his side of the board. My dragon mage finishes off the zombie bunker. In bottom of 5 he flips around his bunker to target my dragon mage, and initially I’m thinking he’s just given me the objective as I have two units on the way and he only has one. He had a strong phase and managed to snipe off the dragon mage (I failed to dispel a 5 to 3 and a 4 to 3 set of dispels on the two snipes). So, I’d given up more points than I had hoped, but I had picked up some decent points myself (1k) and thought I’d won the objective for maybe a 8-12 to him. 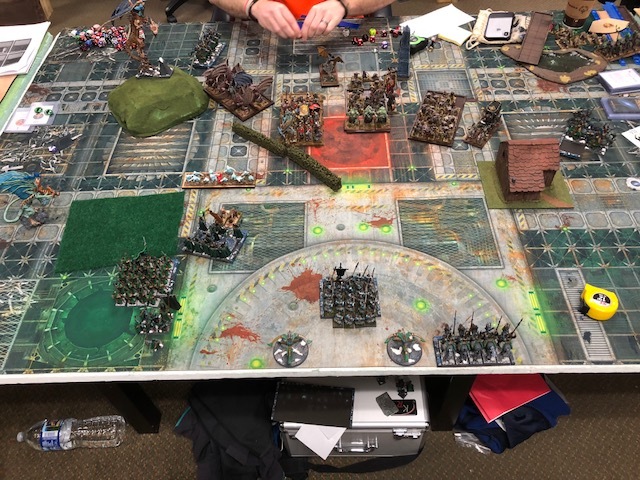 Unfortunately, my opponent pointed out that I’d pushed my units into his side of the table that wasn’t his deployment zone due to dawn assault, so I had actually lost the objective. What an epic mistake on my part, we measured it and had I been thinking of it properly I could have tied the objective with some slight wheeling one unit. Of course, then he would have sent his skellies into my deployment zone and would have given up on killing my dragon mage, which would have at least given me 3-4 more points. As it was I ended up with 3 points…I was pretty disappointed with this result bc I think I played really well against a top caliber player. The mistake with the giff prince, the bad luck with the rymas and the stupidity on the objective really cost me 3-9 points which means I was in striking distance of a win, which I feel ok about. So, not a great start to the tourney, but the results showed that 20s were not super common meaning I felt there was still a chance of achieving my goal if I could pick up my results…onto Game 2. Ah, I've seen a lot of people fall for this trap in deployment zones for Breakthrough. To avoid confusion I point out to my opponent when we start the game what the actual deployment zones are for scoring purposes. I wouldn't go as far as mention it during lategame (in the same way that you don't need to remind your opponent that he just moved his units more than 6" away from an objective marker, for example), but I consider it fairplay to at least discuss the way the scenario and deployment type interact beforehand. Well played otherwise, Mr Mince has the reputation of being a very good player so getting close to a draw is an achievement on its own. As you point out, getting stuck against the Vampires opens up the way for losing big. Thanks man, pretty disappointed with myself, but a good lesson, there is no margin of error against an opponent of his caliber. I do feel good that the core game I played would have been sufficent for a draw, need to keep practicing and refining!